It may have happened in a later iTunes 9 update, but iTunes 10 definitely includes a very helpful update. Plug in any iOS device, iPhones included, and you can play its music or videos without having to make a tricky sync. iTunes' habit of insisting that every new iPod or iPhone plugged in must be a new purchase that you want to sync to your Library—and therefore wipe out all media on the device—was among the worst of its habits. In iTunes 10, and perhaps some up-to-date iTunes 9 versions, you can now plug in an iOS device, tell iTunes to Cancel the sync request, and from there on out simply play music or movies off whatever device you have plugged in through that iconic white cable. 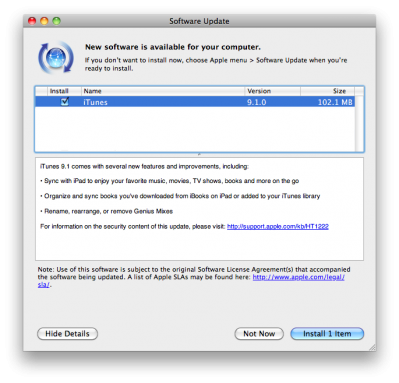 You can download iTunes 9.2.1 here. Improved artwork appearing speed when exploring media library. 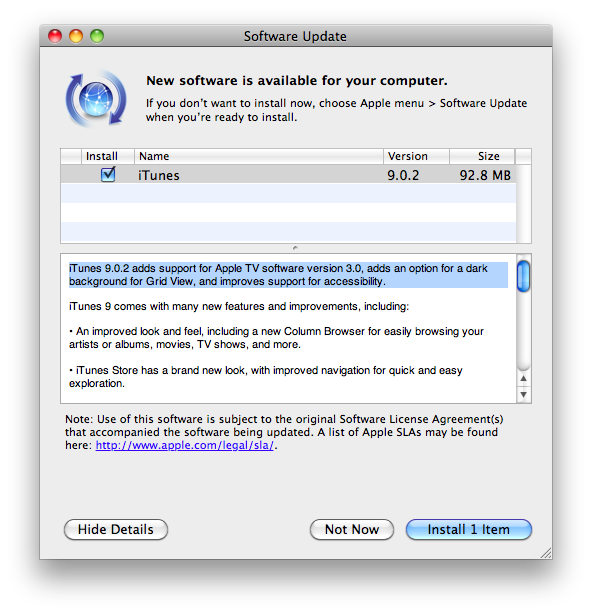 iTunes 9.2 may be downloaded directly from Apple's Site here or via Software Update in Mac OS X (~102MB) or Windows (~92MB). For those who can legitimately activate to the iPhone3G 4.0GM seed, the “point to previous IPSW” redsn0w trick works and will jailbreak your 4.0GM. The “trick” is to point redsn0w at the 4.0beta4 IPSW instead of 4.0GM (do this after you've updated to 4.0GM and activated through the new iTunes 9.2 on your Mac). 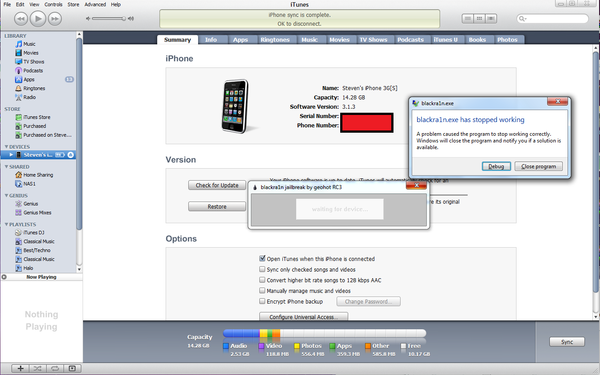 Since the carrier unlocks aren't yet supported at 4.0, don't do this if you use yellowsn0w/ultrasn0w/blacksn0w. Many JB apps are still pretty buggy in 4.0, so again this is mostly useful only for developers of those JB apps. Note: If you're experiencing MobileSafari crashes, double check that you're running the version at the bottom of this page. Addressing some issues that improve stability and performance. More information about security updates can be found on Apple's support page here. 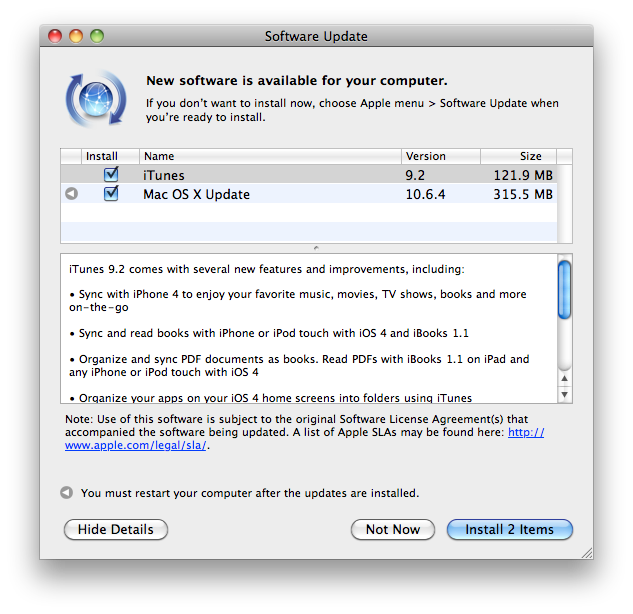 You can update your iTunes via software update utility or download it directly from Apple. "Blackra1n hooks to the dll that has different offsets of what it is actually looking for". Yesterday Apple released iTunes 9.1. With a new version you can sync with your iPad to enjoy music, TV shows, movies and many more while you're on the go. The app will help you to organize and synchronize books that have been downloaded from iBooks on your iPad. The improvements also include more freedom in managing Genius Mixes and several security updates. To learn more visit Apple Support page. 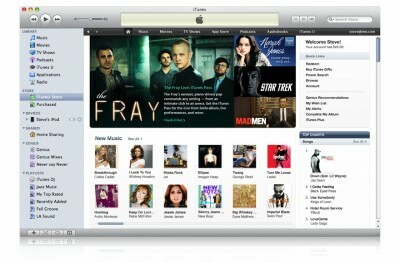 To update your iTunes select Software Update in the Apple Menu at the top left of the screen. 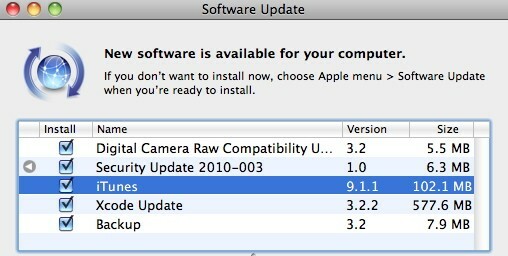 Yesterday Apple updated iTunes version to 9.0.3. First of all, now the app can finally remember your password while you're making your purchases. 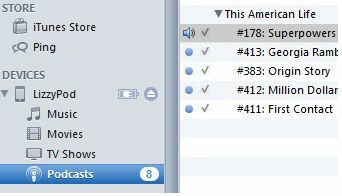 Also some problems with syncing Podcasts and Smart Playlists with iPod were solved. An update contains some improvements in stability and performance. Also it fixes a few minor issues and bugs. 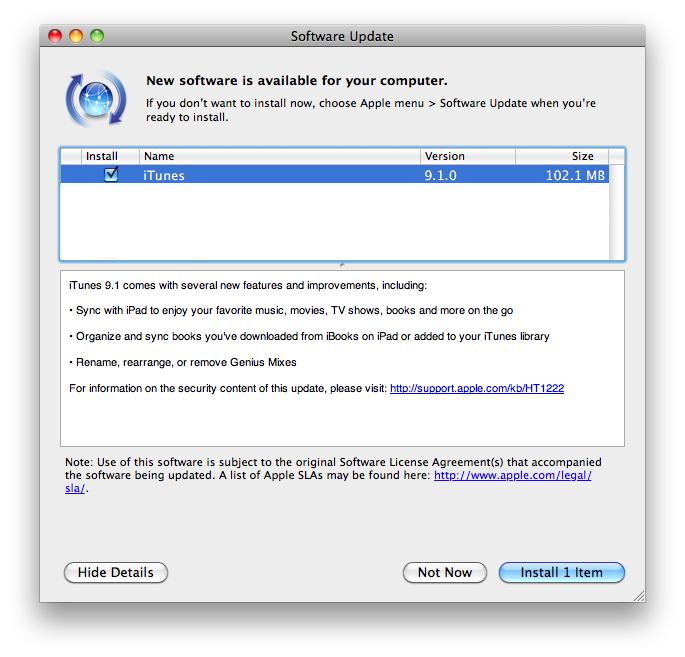 iTunes 9.0.3 is available now for update from the software update mechanism in Mac OS X and Windows or on the official site. 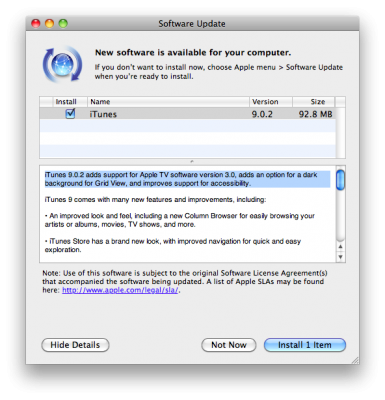 Apple just released an update to iTunes, bringing the latest version to 9.0.2. According to PreCentral.net, this update also kills Palm Pre webOS sync. Again. You can download iTunes here or through software update. Updated: MuscleNerd has just confirmed that the update does not affect the Jailbreak, users can still use custom firmware. You can easily upgrade to 9.0.2. 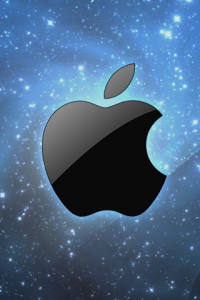 Apple today announced financial results for the fourth fiscal quarter (third calendar quarter) of 2009. Apple posted revenue of $9.87 billion and net quarterly profit of $1.67 billion, or $1.82 per diluted share, compared to revenue of $7.9 billion and net quarterly profit of $1.14 billion, or $1.26 per diluted share, in the year-ago quarter. Gross margin was 36.6 percent, compared to 34.7 percent in the year-ago quarter, and international sales accounted for 46 percent of the quarter's revenue. The numbers represent the most profitable quarter in Apple's history and include record-breaking Mac and iPhone quarterly sales. Jailbreak'ers - do not worry, everything works just fine. iFunBox is a Windows application to easily access iPhone file system. It allows you to manage the iPhone and the various folders via a USB connection. With iFunxBox you can transfer files or music to the iPhone or copy pictures and video from it on your PC without using an SSH connection. The last version is iFunBox V0.9.257.241 and it is compartible with firmware 3.1 and iTunes 9. MediaMemo reports on claims from music industry sources that Apple is planning a keynote event for the week of September 7th. 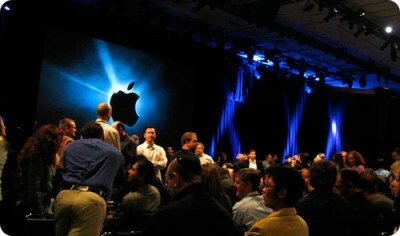 Rumors say that some expected topics are Snow Leopard , iTunes 9 and new iPod Touch with camera and microphone. 2008: "Let's Rock" - iTunes 8 and new iPod touch, nano, and shuffle models. 2007: "The Beat Goes On" - original iPod touch, updates to the iPod line, iTunes 7.4 update, iPhone price drops. 2006: "It's Showtime" - iTunes 7 and iPod updates, Apple TV. 2005: "Here We Go Again" - Motorola ROKR mobile phone with iTunes support, the release of iTunes 5, introduction of the original iPod nano to replace the iPod mini.